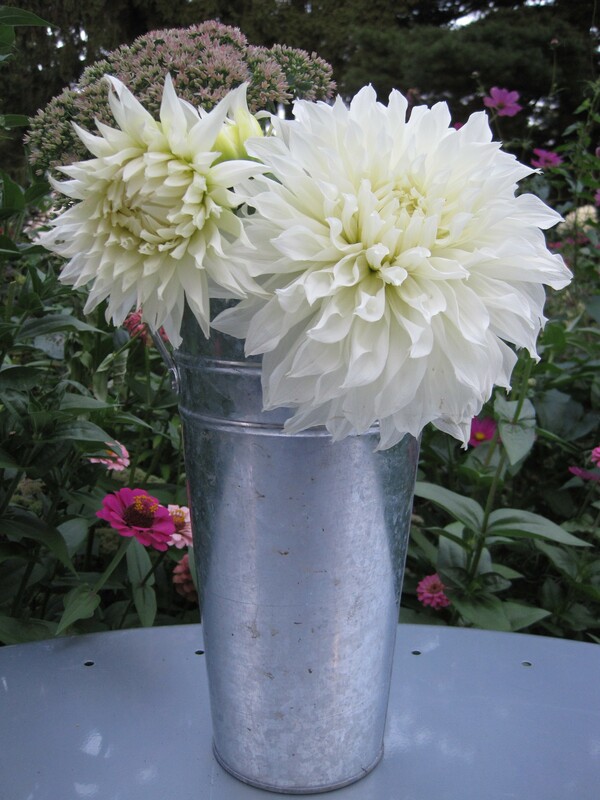 One of my garden’s big success stories this past summer was dinner-plate dahlias. I have tried to grow a variety of dahlias for years with little to moderate success, but for 2009, I tried a different growing approach and I enjoyed a bumper crop! Dinner-plate dahlias definitely won most improved flower of the summer. In the past, I would plant the bulbs all around my garden, trying to fill in gaps, and not always in the sunniest spots. But this year, I put all my dahlias in one spot – in full sun behind my garage. When I planted the bulbs I put tall, strong stakes in. I also kept the plants well staked throughout the entire growing process. This proved to be the magic formula for the batch of bulbs I picked up at Costco. 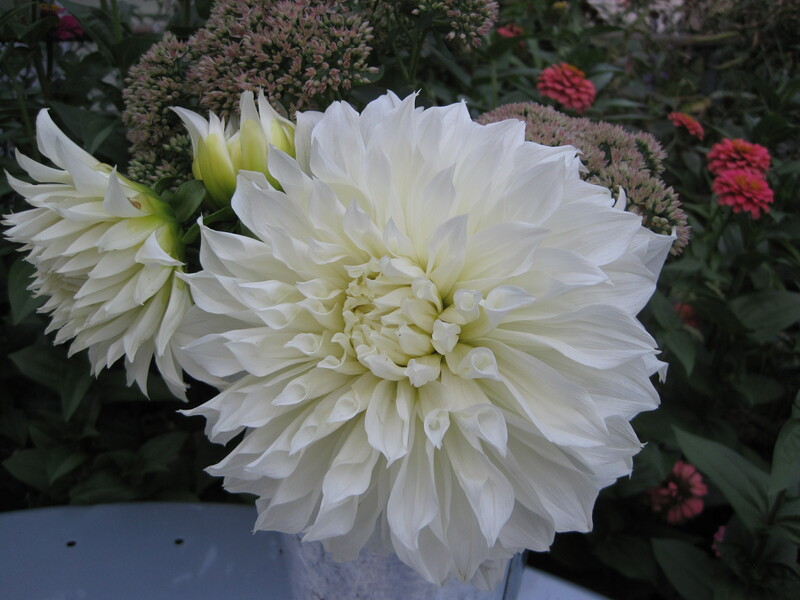 I was just online earlier today looking at dinner plate Dahlias. I’ve never grown them, and am considering it. I ahve been almost exclusively a food gardener, but want to strat growing flowers for the table, as well. Fortunatley my yard is ALL sun. However, I wouldn’t have thought about giving dahlias support. So thanks for the tip. 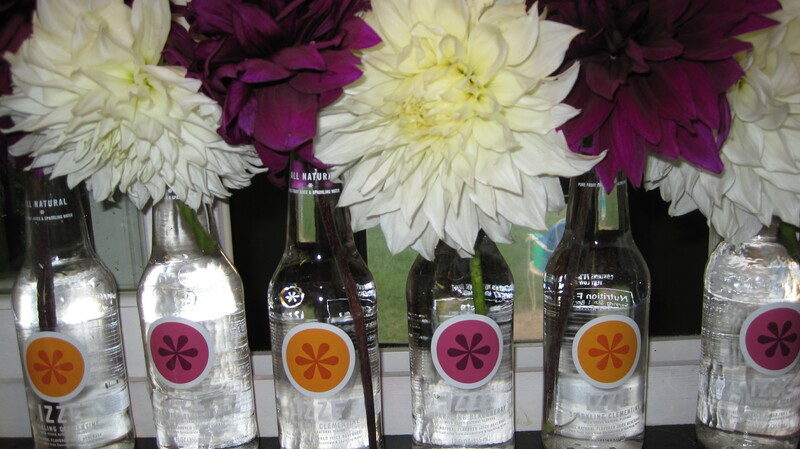 You will love growing Dahlias!!! One thing I forgot to mention is they are not hardy in our zone 5, but you can dig the tubers up after the first hard frost and store them in a basement over the winter and re-plant them again in the spring.